Imagine buying a new car,the big day arrives when you go to collect it, but as you’re leaving the dealership and reach to turn on the radio, you see there isn’t one! You quickly u-turn back into the dealership and upon enquiry are informed that not only are you without a radio but a spare wheel, indicators and airbags. Although these were included in the original quote you now need to pay extra! Happily this is not usually the case when buying a car, but unhappily is typical when building or renovating. Why is it that when we purchase any other product or service, we pay the quoted amount and normally get what we pay for? Not so when building or renovating; the most common experience being that the building contractor asks for more money than originally quoted at some point during the project. The client is then left to find additional finance, to complete the project. At the very least, they have a fight with the builder on their hands, are over budget, and have a “shortfall” in their building bond, at worst, severely financially compromised. Why is this experience so common? The reason is that it is an extremely technical and time consuming process to accurately calculate the cost of building, a skill held by only the most professional contractors. 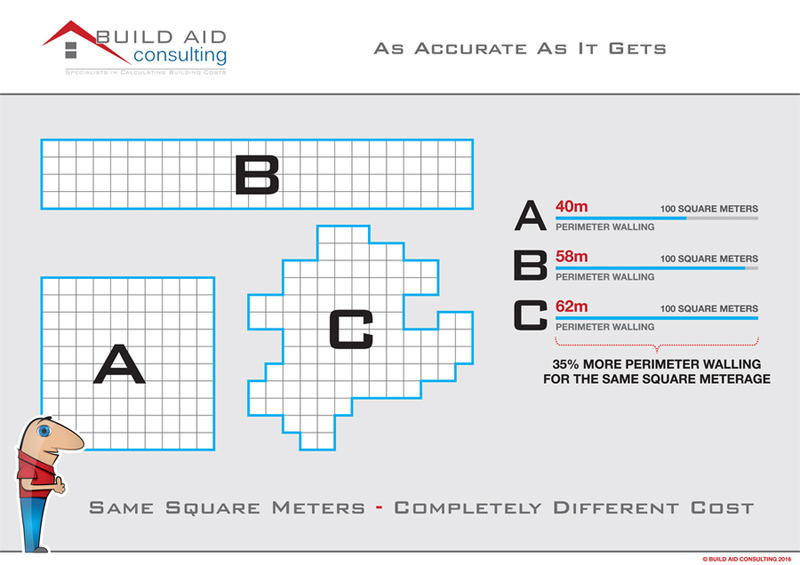 As a result most quotes are based on the highly inaccurate “square metre rate”. A Toyota and a Ferrari are exactly the same size in m2, and have the same features: they both have four wheels, a windscreen, steering wheel, headlights etc. Should they both be the same price? House ‘A’ measures 10×10m (square), and ‘B’ 25×4m (rectangle), both are exactly 100m2. But, the walls of ‘A’ are 40m long and the walls of ‘B’ are 58m long. This is an extra 18m of walling, almost 50% difference. This inaccuracy alone would cost an extra R40, 000.00. There are many other factors that need to be taken into account apart from the length of walls in order to accurately quote on the cost of building, such as roof type, wall height, the number of bathrooms etc. all of which mean that the m2 method of costing should not be relied upon at all and hence going ahead with building based on one of these quotes is a recipe for financial disaster. Many articles have been written about this very issue but none have provided a solution. The solution is to have an independent Cost Analysis / Estimate produced before appointing a Building Contractor. This will mitigate the risks, by providing you in advance with detailed knowledge of what your project should cost you. While banks have experience on their side, they also use the m2 method in part, to evaluate a building loan application. While certainly less common, building loan clients too often face a shortfall as a result. Insurers too, use the m2 method in part to determine the insurance value of a home. Again it is not uncommon for a homeowner to find that they are in fact underinsured as a result, under the worst of circumstances. Tender fraud could be reduced as a cost estimate would provide a ‘benchmark’ for tenders to be evaluated against as well as enable emerging builders to compete. Type the characters you see below. Please note: input is case sensitive.